The SOMMER TGL is a closed body in a lightweight design. It is available for most van chassis of the commercial vehicle class up to 7.0 tonnes. The optimised lightweight construction of plastic panels in a sandwich design facilitates a weight saving of up to 25 percent. For you this means: more payload, less consumption. The SOMMER TG offers up to 38 m³ load volume depending on body length and width. It comes as standard with steel lashing rails on both side walls for proper load securing. The SOMMER TG is also available with the patented SOMMER SALS® cargo control system on request. The robust steel sub-structure gives the design added stability. It is completely galvanised and, thus, has lasting corrosion protection. The standard roof of translucent glass fibre reinforced plastic is extremely stable and provides pleasant daylight throughout the body. Steel lashing tracks inside on the side walls form the basis of effective cargo control. Many other cargo control options on request. Stainless steel fittings on the rear doors guarantee high functionality and low maintenance for the vehicle‘s whole service life. 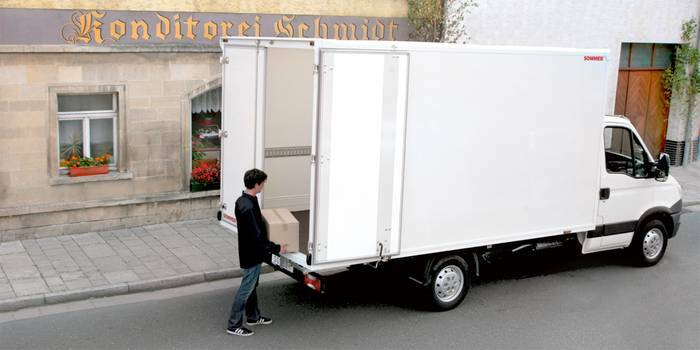 For the lightweight box body SOMMER TG we offer various tail-lifts from the leading tail-lift manufacturers, Dhollandia, Bär, Dautel and Sörensen.